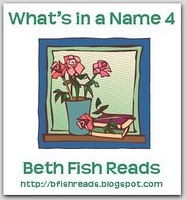 Beth of Beth Fish Reads is hosting the What's in a Name challenge - fun unrelated categories I love making lists for! :-) The 2010 edition was great fun - and one of the few challenges I actually completed during this busy year. This year's categories are below - getting more and more creative, I think! If you have any suggestions let me know - I can't think of many choices for some of the categories! I've joined this challenge, too. I also have Little Children on my list, although I listed it as my life stage choice. Alex - Thanks, I'll keep those in mind! Oh definitely read Girl with a Pearl Earring. Such a great book. I really like the What's in a Name Challenge. Such fun coming up with titles to fit.